Learn more about Monarch Nucleic Acid Purification Kits. Quickly and easily purify high quality DNA from PCR and other enzymatic reactions. The Monarch PCR & DNA Cleanup Kit rapidly and reliably purifies up to 5 μg of concentrated, high-quality DNA from PCR and other enzymatic reactions. The kit utilizes a bind/wash/elute workflow with minimal incubation and spin times. 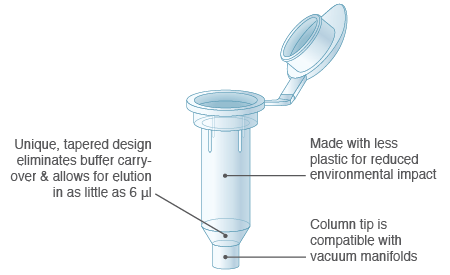 The columns ensure zero buffer retention and no carryover of contaminants, enabling elution of sample in volumes as low as 6 μl. The buffers provided have been optimized, and do not require monitoring of pH. 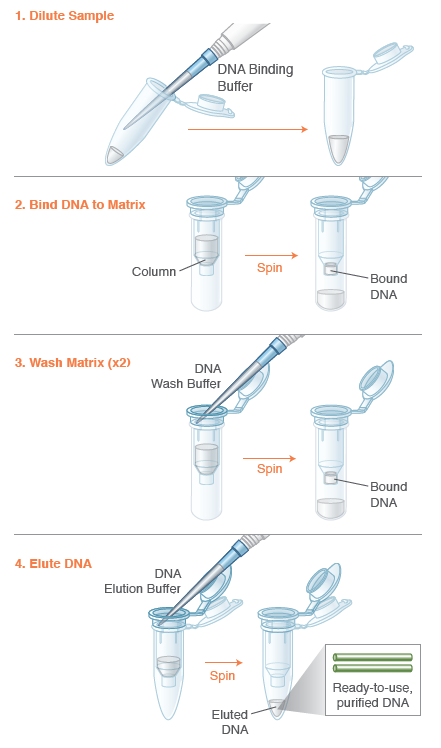 Eluted DNA is ready for use in restriction digests, DNA sequencing, ligation and other enzymatic manipulations. Designed with sustainability in mind, Monarch kits use significantly less plastic and responsibly-sourced, recyclable packaging. The protocol can also be modified to enable the purification of smaller DNA fragments, including oligonucleotides and ssDNA. PCR cleanup DNA from PCR reactions can be purified after amplification to remove polymerases, primers, detergents, dNTPs, etc. Enzymatic reaction cleanup Restriction enzymes and modifying enzymes such as ligases, kinases, nucleases, phosphatases are efficiently removed, allowing for effective desalting and concentration of the DNA sample. 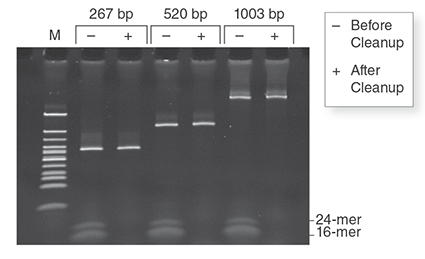 cDNA cleanup DNA/RNA complexes can be purified post-reverse transcription/amplification to enable removal of the RT and polymerase as well as nucleotides. Plasmid cleanup Plasmid preps from unknown sources may contain inhibitors and unwanted contaminants. Purification and concentration can be easily achieved using this kit. Oligonucleotide cleanup ssDNA oligonucleotides (≥ 18 nt) and dsDNA fragments (≥ 15 bp) can be purified using the Oligonucleotide Cleanup Protocol. DNA Sample Type: DNA from PCR and other enzymatic reactions (e.g., restriction digests, kinase reactions, ligations). ssDNA or dsDNA oligonucleotides from enzymatic reactions can also be purified using the Oligonucleotide Cleanup Protocol. Preps were performed according to recommended protocols. 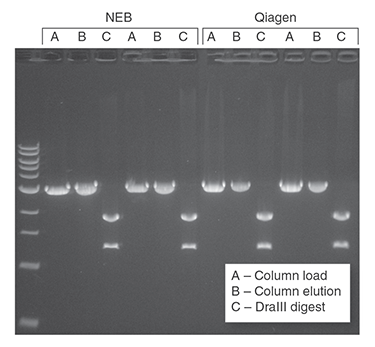 1 μg of a 3 kb DNA fragment was incubated with 1 μM primers and OneTaq® Quick-Load® 2X Master Mix (NEB #M0486). DNA was eluted in 20 μl (NEB) and 40 μl (Qiagen) Elution Buffer. Half of the total elution volume was digested with 5 units of DraIII-HF® (NEB #R3510). The digest and the unused portion of the elution were resolved on a 1% w/v agarose gel along with a representative sample of the starting material. Three independent amplicons (267 bp, 520 bp, 1003 bp) were spiked with two oligonucleotides (16-mer, 24-mer) to a final concentration of 1 μM. Half of each mix was purified with the Monarch PCR & DNA Cleanup Kit (5 μg) following the included protocol. Equivalent fractions of the original mixture and the eluted material were resolved on a 20% TBE acrylamide gel at 100V for one hour and stained with SYBR Green II. Reagents added incorrectly. Check protocol to ensure correct buffer reconstitution, order of addition for buffers, and proper handling of column flow-through and eluents. Ethanol has been carried-over. Ensure final wash spin time is 1 minute to ensure complete removal of the wash buffer from the column, and be careful when transferring the column to a new tube for elution step to ensure column tip does not contact column flow-through.